A list of projects that I'm interested in. This project was created on 05/09/2018 and last updated 14 days ago. Sawppy is a motorized model whose layout and proportion mimics that of Mars rovers Curiosity and Mars 2020. It faithfully reproduces the suspension kinematics of real rovers and is intended to be a hardware platform for future software projects in autonomous operation. Go forth and boldly explore the back yard, Sawppy! Sawppy the Rover was inspired by JPL&apos;s Open Source Rover project. Most of the differences between Sawppy and its JPL inspiration were motivated by a desire to reduce cost and complexity. JPL&apos;s rover is designed for education, to be assembled by a school team and give a robust foundation for structured curriculum. Sawppy is more suited for individual hobbyists like myself who are happy to tinker and willing to make some trade-offs to lower cost. Motorization: Instead of using gearmotors with encoders managed by RoboClaw motor controllers, moving the wheels will be done with serial bus servo motors. Construction Method: Instead of using the Actobotics construction system, Sawppy will be built from Misumi 15mm 3-series aluminum extrusions beams connected by 3D-printed plastic parts. These two major design goals can be summarized as: Servo Actuated Wheels, Printed Interconnect For Extrusion. The acronym SAWPIFE led to the nickname "Sawppy". Github: This is where the assembly instructions currently live. It also has a snapshot of Sawppy components in STL file format. These parts may lag behind the live CAD data, but they have been printed, installed, and proven to work on my rover. Build Blog: The history of Sawppy, including stories of design goals and lessons learned from failures. It&apos;s been a few months since I declared Sawppy version 1.0 (mechanical foundation) complete and it&apos;s very exciting for me to see people build on top of what I&apos;ve released to the world! Bob Krause (Inventor Studios): A few of Sawppy&apos;s parameters were changed for this variant. Instead of just manually editing individual numbers, Bob & crew put in the work to make Sawppy more configurable. Updates to specific parameters are automatically propagated to affected parts. See comments section for Bob&apos;s description. Quinn Morley Mars Drill: This project explores the idea of robots drilling for water on Mars. A scaled-up variant of Sawppy serves as the initial testbed mobile drilling platform. Daniel Perron&apos;s Wood Beam Variant: When I designed Sawppy, I didn&apos;t know how easy or hard it would be to procure parts outside the United States. According to Daniel, the Misumi extrusions are really expensive in Canada. But he is resourceful with experience in woodworking, giving us a delightful variant. 3 × 1 kg spool of 3D printer filament Exact amount of filament used will depend on slicer settings, see "Instructions" section. 3 × Box of 100 M3 washers (< 10mm diameter) Fastening 3D-printed components to aluminum extrusions. Design can accommodate up to 10mm diameter washers, larger washers will require modifying CAD file. One of the problems I didn’t foresee in designing Sawppy was that some children might see a fun challenge in doing running jumps over my rover. I first saw this unwelcome behavior when I brought Sawppy to Long Beach, and I knew it’d only be a matter of time before a child would misjudge their jump and smash Sawppy into a pile of broken rover pieces. Clearly I need to find some way to discourage this behavior, but I also can’t do anything that physically harms misbehaving children. This eliminates straightforward solutions such as a Samurai blade pointing straight up. I would also like this countermeasure to be stealthy and not call attention to its anti-jump purpose otherwise some would see it as a challenge. The answer came while preparing for this year’s Southern California Linux Expo (SCaLE 17x). I was scheduled to host the Hackaday x Tindie Birds of a Feather meetup, and I was also slated to co-present a talk with Lan Dang. For publicity purposes I decided Sawppy can be a rolling billboard, as SCaLE is exactly the right audience of people who would pay attention to a 3D-printed rover running about. I pulled out a yardstick I had on hand and started planning how to use it as a flag pole, and I immediately knew I had my anti-jumpover countermeasure as well. Two birds, one stone. As previously mentioned, I didn’t want this flag pole to be too rigidly attached. If someone bumps my sign, or if someone decides to try jumping over my rover anyway, the flag pole must break away cleanly without damaging the person or the rover. For SCaLE I used a zip tie that was arranged so there is tension holding the yardstick flag pole in place, but pops free when stressed. This mostly worked, but as it was built on a balance of opposing forces, it was finicky to reinstall. At Caltech Science for March, a curious toddler yanked off the flag pole and the toddler’s supervising elderly adult tried to reinstall the pole. But grandpa had no idea what he was doing, blindly stabbing inside Sawppy’s equipment bay with the yardstick applying more force as he grew more agitated. After two attempts at saying “Don’t worry, I’ll put it back myself” while I watched in horror at Sawppy electronics getting pummeled, I forcibly grabbed the yardstick from his hands in order to save Sawppy from being stabbed to death. Clearly, a better solution must be found. In preparation for Sawppy’s appearance at Yuri’s Night, I decided to try a magnetic mounting system. Originally rejected because I thought it wouldn’t be strong enough, I thought it was worth a second look. I had a stack of these powerful little magnets and a single pair wasn’t able to hold the pole. But four pairs of them might be strong enough for the task. For this test, four magnets were held on to chassis beam via packing tape. Two on upper beam, two lower. Matching sets were held to yard stick flag pole with more tape. With updated camera mast and flag pole mount, Sawppy was ready for its next public appearance at Yuri’s Night Los Angeles! That event got crowded at times and there were a few accidental bumps that triggered a clean separation followed by quick re-installation. And while this adult-focused event had few children about, there were plenty of drunken misbehaving adults. The flagpole did not discourage all misguided behavior, but it has worked well enough to become a permanent fixture of my future Sawppy public appearances. When Sawppy first started running around, I wanted something to sit atop a camera mast where the real rover has a camera and sensor array. It is the anthropomorphic head of the rover and it looks slightly wrong without one. (Like a chicken running around without its head.) The first iteration of camera mast sensor array enlisted a standard USB webcam sitting alongside a Google AIY Vision kit. It was mostly for appearance because there wasn’t much software behind it. The webcam was fun for entertaining children and occasional longer distance driving, but not immediately useful for autonomy. The AIY Vision box is optimized for classification tasks. I thought there might exist code useful for robotic visual localization but if it’s out there I have yet to find it. The most promising tool at hand for rover localization is my Kinect sensor bar running RTAB-Map or some similar software. So Sawppy will inch towards autonomy by getting a camera mast upgrade to my Kinect V1 sensor bar and see if we can integrate that into rover systems in a useful way. I went looking for a good way to mount a Kinect bar to Sawppy. I disassembled its base looking for a good mounting mechanism, but there weren’t convenient existing fasteners for me to use and there weren’t good places for me to drill and tap new ones. It was surprisingly crowded in there! I knew there was a motor for up/down tilt but I underestimated size of the motor gearbox inside. I then reassembled the base and went with plan B: a simple flat platform for attaching my Kinect sensor bar with double-sided foam tape. Kinect sits slightly offset camera mast center for two reasons. The Kinect sensor bar is very wide and if mounted centrally it overhangs to the right. I worry about it hitting obstacles so I wanted to bring it closer to the middle. By offsetting sideways, I could expose the top of the pipe used as camera mast and run Kinect’s wire down the middle for cleaner wire management. At the moment this Kinect is no more functional for autonomy than the previous configuration… in fact, for its first public appearance at Yuri’s Night 2019 it is not even electrically connected to anything. It’s just a matter of taking one step at a time. I&apos;m happy to see interest in Sawppy continue to grow and my little rover now has something of a publicity appearance schedule. Summaries of the past few appearances have been cross-posted on my personal blog as well as this project page, but going forward I think I should keep this project page focused on technical evolution and skip the non-technical stuff. As the first implementation of this new policy, here&apos;s the summary for Sawppy&apos;s attendance at Yuri&apos;s Night Los Angeles 2019. Anyone who&apos;s interested can follow the link to read more, others can skip this log entry without having to do a lot of scrolling. I had always intended for Sawppy to be an adventure in building autonomous robots, but the Sawppy hardware I built and declared version 1.0 needed software of some sort in order to get up and running. Since I had code for SGVHAK Rover handy, I adapted it to control Sawppy as well. Both rover models had six wheel drive and four wheel steering resulting in large overlaps of functionality. I only had to write adapter code for it to communicate with Sawppy’s LewanSoul serial bus servos instead of SGVHAK Rover’s RoboClaw motor controllers. At the time I was overly optimistic about how quickly I could get new software up and running on Sawppy. I didn’t climb the learning curve for ROS nearly as fast as I had hoped, requiring detours along the way to build learning robots like Phoebe. In the meantime Sawppy continued running on this “interim” software that threatens to become the permanent software with each passing day. But now I’m starting to receive queries from people who want to run SGVHAK rover code on their Sawppy rovers as well. While a talented few have been able to find their own way just by examining my Github repositories, it’s not very friendly to tell people “Go look at the code and figure it out.” I need to put in the time to write instructions for putting SGVHAK Rover software on Sawppy. I’m happy to announce that this work is now complete and posted up on Sawppy’s build documentation repository. It walks through assigning unique IDs to LewanSoul serial bus servos, to which configuration files to edit, and which configuration files to just completely overwrite. I hope this will help more Sawppy builders get their rover up and running! It&apos;s been a few months since I declared Sawppy version 1.0 complete and documented. A project like this is never done and there&apos;s always more to do, but I had reached a good milestone in mechanical design supported by "good enough" electronics driven by software borrowed from another rover project. I released it open source to the world, curious what would happen next. I was very happy to see people go beyond just talking about building their own Sawppy, and have gone ahead and actually done so. In the course of their builds, people have reached out to me with questions about the information I&apos;ve published, which I welcome. It&apos;s always good to have extra sets of eyes to look over what I&apos;ve written. Sawppy documentation is my best effort, but it&apos;s very easy for me to overlook gaps in information because it&apos;s all in my head and my brain doesn&apos;t necessarily notice when something crucial is missing. Having other people try it out and letting me know of their experience is the best real world test, and I add clarifications in response. And this past week the Sawppy project documentation crossed another threshold: its first external contribution pull request! I really appreciate the work of [TechMav75]. Not just point out gaps in my documentation, but actually rolling up sleeves and helping to patch those gaps based on their experience building a Sawppy. Thank you! As for software, SGVHAK Rover&apos;s adapted software was always intended as a placeholder, not the long term software solution for Sawppy. Indeed the first three Sawppy builds I&apos;m aware of didn&apos;t use that software, either. Two builders have written their own rover software, and a third has wired up their rover for standard remote control. Nevertheless, some Sawppy builders want to use what works today so I should put in the time to write more detailed instructions on how to adapt that code to drive Sawppy. In the immediate present, user feedback has alerted me to an embarrassing bug that I&apos;ve since fixed. It&apos;s not my first public embarrassment, it won&apos;t be the last. I encourage asking questions in public so my public answer will be useful to others as well. From the top of this project page, click on "Discussion", and add your comment. If you rather not comment in public, you can send me a private message. Click on my name to reach my Hackaday.io profile, and click "Send a private message". File an issue on Sawppy&apos;s Github repository. And finally, my favorite: not just file an issue, but also send me your proposed solution via a pull request! Let&apos;s work together to make Sawppy better. Every time I encounter problems at a public Sawppy appearance, it is a lesson. It might be a lesson in how I might be able to improve Sawppy’s design, or it might be a lesson in how to better prepare a kit for field repairs a.k.a. Sawppy First Aid Kit. When a fuse burnt out at Caltech Science for March 2019, that was easy to address: add replacement fuses to the kit. The broken servo coupler encountered at SCaLE 17x was a little tougher. It wasn’t enough to keep an extra 3D-printed coupler handy, because a little block of plastic isn’t very useful by itself. It requires a heat set insert to accommodate a set screw holding against an 8mm shaft, and it requires four more screws to fasten against the servo horn. Fiddling with a lot of tiny screws would not be very practical when trying to make field repairs away from my workbench. This is especially true when I have a literal ‘field’ to deal with: on grassy grounds where a lost screw is very difficult to recover. Set screw already installed inside the heat-set insert. Servo horn that comes with a serial bus servo. 4 small screws already fastening the coupler to the servo horn. With such an assembly ready to go, the only fastener I risk losing during replacement is the screw holding the servo horn to the servo output spline. The first downside of this approach is that I only have as many servo horns as serial bus servos. Keeping a replacement unit ready in Sawppy’s field repair kit means I have an extra serial bus servo with no horn to use it. Perhaps I could purchase extra servo horns, or maybe this is just a hint I should also have an extra replacement servo in the bag. The second downside of this approach is that, in case of steering couplers, a replacement would not be an identical. Steering trim would be slightly different with a replacement coupler due to natural variation from unit to unit. When I perform this replacement, I would also have to adjust Sawppy’s steering trim for proper operation. But in an emergency? It’ll probably be close enough. Today Sawppy joined the fun at Science for March 2019, organized by the Caltech Postdoc Association. Since Sawppy didn’t exist yet during 2018’s event, this was Sawppy’s first visit. When Sawppy arrived at South Campus Gate, a quick check of campus directory oriented us to Beckman Mall where the event will be held. Part of the journey included crossing picturesque Millikan Pond. As with last year’s event, the rover started the day sitting on a table for display. Of course, last year we had only a single rover. This year we have three, two of which were in running condition and could be driven for demonstration today. Sawppy attracted a crowd as it usually does, and were driven around by enthusiastic children. Some of them weren’t as gentle with the control as they should be, and about halfway through the day, operator roughness by one of the kids burned out the fuse. I kept telling myself I should have spare fuses in Sawppy’s first aid kit that I keep in my backpack, but I never did put one in. I had to hack a workaround today but by the end of the night I definitely remembered to put extra fuses in the bag. Group rover outings are always fun. Today’s special activity is a group climb on a grassy slope at the north end of Beckmann Hall. 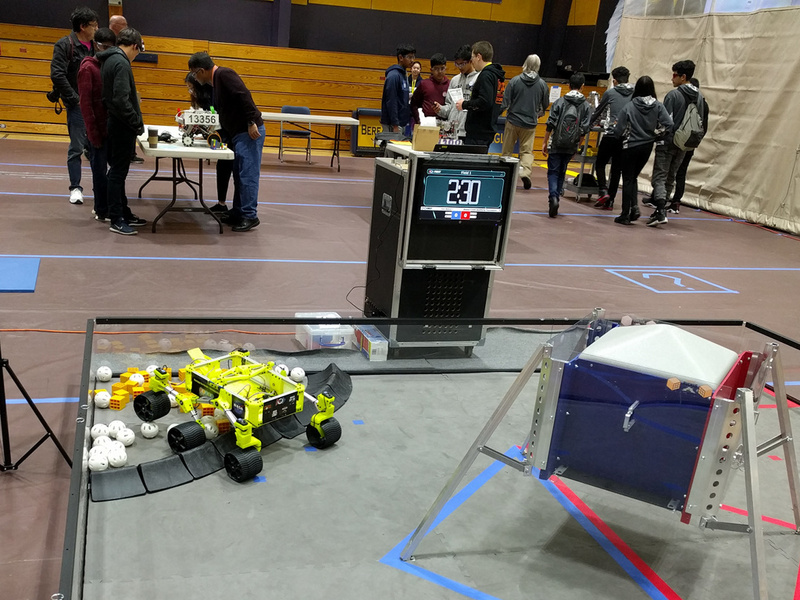 SGVHAK rover gave Sawppy a head start, but with faster and more power motors, combined with better traction tires, it was no contest. SGVHAK easily outclimbed Sawppy, but the important part was that we pleased the crowd with this little demonstration of rover climbing capabilities. When I declared Sawppy the Rover has reached version 1.0 and posted instructions online, I was fully aware of the fact that the instructions would be incomplete. Not out of neglect or malice, but out of the fact all of Sawppy is in my head and there will be places where I decided something was obvious enough not to require documentation – and learn I was wrong in that judgement. Such is the case now. 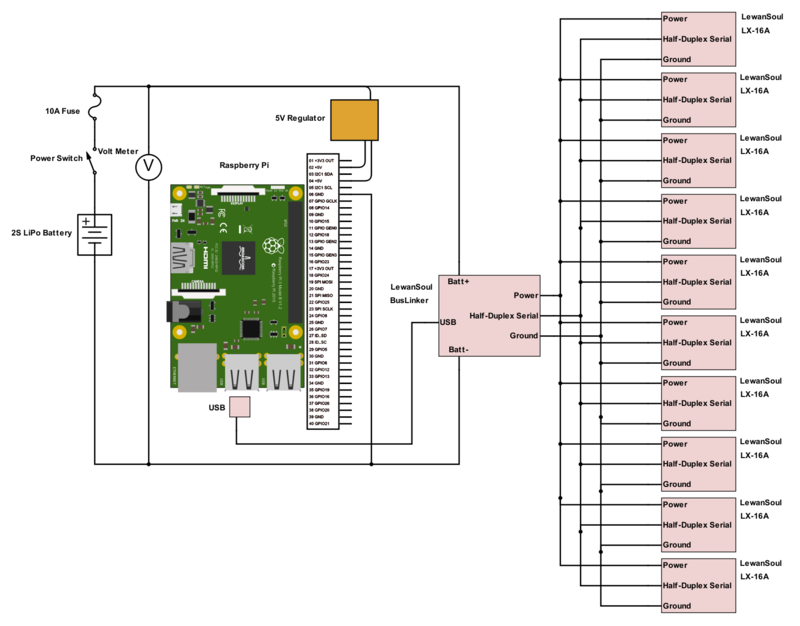 One member of RSSC accepted my invitation to build a Sawppy after my presentation in January, and submitted the feedback that I need to post a schematic of how I’ve wired up Sawppy. I previously submitted this answer as response to a comment on this Hackaday.io project page, but more detail was needed. The minimum electronics components for a bare-bones Sawppy has [10 * LewanSoul LX-16A] wired in parallel with each other and to [1 * LewanSoul “BusLinker” a.k.a. “Debug Board”] to translate generic USB serial to servo half-duplex serial. That translator board is connected to [1 * Raspberry Pi] via USB. I thought this was a good opportunity to try Scheme-It from Digit-Key. It is a web-based electronics schematic editor that purports to let people quickly sketch up electronics schematics for sharing. The electrical wiring for a bare-bones Sawppy version 1.0 should be a nice easy exercise for this tool. The terms and conditions for using Scheme-It is fairly typical for a web-based application. A Digi-Key account is required for login, something I already had from earlier purchases for electronics experiments. In exchange for free use of the software, a user also has to grant Digit-Key a license to the schematic. Not a big deal in this case, as I wanted Sawppy to be shared as widely as possible. And finally, Digi-Key reserves the right to take down this service at any time, deleting all of my data. This is irritating but not unexpected. If this is important to me I better make a copy for my own storage. Since my sample schematic is fairly simple, it only took about an hour to go from absolute beginner to the schematic I wanted to create. I could (and did) choose to share the project file publicly via a URL, though it appears accessing the project requires logging in to Scheme-It, which required a Digi-Key account as previously mentioned. I could also export to PDF or PNG formats. The PDF export feature was unsatisfactory. Many labels were moved out-of-place making the schematic illegible. In contrast the PNG export looks OK so I’ve posted this schematic PNG to the files section of this project page, as well as Sawppy’s assembly instructions hosted on Github. My primary obligation for Southern California Linux Expo (SCaLE 17x) was to co-present The Trouble with Rovers with Lan Dang on Saturday afternoon. Which meant when Sawppy’s coupler broke Friday evening I had to scramble to fix it for Saturday. A rush repair job is always going to leave some details to be desired but it was sufficient to resume operation. Sawppy will obviously be one of the visual aids present at our talk, but that doesn’t mean it gets to spend the rest of the day just sitting around. No sir, as soon as Sawppy arrived on location, it immediately started working as a roving billboard for both itself and the talk. It was not explicitly coordinated beforehand, but the SGVHAK rover was also equipped with advertising for our talk. Both of our rovers were out and about, pulling roving billboard duty, and occasionally our paths crossed in the hallways of SCaLE. I was happy with the turnout for our rover session. While we did lose a few people who left partway through the talk, it was more than made up for by the enthusiastic people who followed along and came up to ask questions after. I had a lot of fun explaining details on what we did for both rovers, minutiae that we trimmed from the talk proper but was still interesting to our smaller and more technical audience afterwards. Sawppy continued to roam around Pasadena Convention Center, spreading word of my rover project to people who are excited about the possibility of building their own. Some people thought it would be their motivation to finally buy their own 3D printer, others have all the tools on hand and it’s just a matter of prioritization and finding project time. I was most gratified by a group of students from California State University San Bernardino who thinks it would be a great group project. They are exactly the target audience! And it’s fun as always to see young children’s faces light up when they see Sawppy, some of whom were eager to take control. My favorite was this 6-year old who loved to drive Sawppy over his own toes over and over. Before I took Sawppy to its first day of SCaLE 17x, I checked over all mechanical bits and found a cracked steering coupler. My first instinct was to repair my rover by replacing the coupler, but I decided against it because it was still partially functional. I wanted to see how my rover design behaves with some partially broken parts, find out how tolerant of faults it would be. The answer is: surprisingly well! When everything is in newly assembled condition, the steering assembly could keep its wheel steering angle within a few degrees of the desired position. There is still some error due to flex in the PETG plastic through all component interfaces leading from the servo’s output shaft, through the coupler, through the 8mm steering shaft, through the steering knuckle, through the wheel bearing, the bearing axle, and finally the wheel itself. With a cracked steering coupler, the steering assembly could still hold angle within about a 20 degree range, or +/- 10 degrees of the desired position. This isn’t great, but like its Mars inspirations, Sawppy was able to keep running with a damaged wheel. I was able to do the usual crowd-pleasing demonstrations running over backpacks and feet. While steering was a bit wobbly, Sawppy has five other wheels to compensate and maintain most of its steering authority. I thought I’d just continue running the rover until something finally gave. And it did, just not the way I expected. Instead of a gradual degradation in rover operation, what finally killed the coupler was a child. About 6-8 years in age, the boy grabbed the steering wheel assembly in both hands and twisted hard. I heard a loud POP and that was the end of the coupler. The boy knew he was going to be in trouble and ran off, the associated adult was apologetic, but that doesn’t change the fact I now have a broken rover. Yesterday the coupler was cracked below the set screw. Now the crack goes all the way to the top and there’s no longer enough force to hold the heat-set insert in place. Once the heat-set insert popped out of place, its set screw no longer has leverage to grip the detent I cut on the steering shaft. A steering shaft that spins nearly freely makes Sawppy very hard to drive. I was able to move a little bit at the Tindie x Hackaday Birds of a Feather Session, but Sawppy could not perform its usual rover capability demonstrations at the meetup. After a loss of data event for instructions posted to hackaday.io, Sawppy the Rover&apos;s build instructions are now hosted on Github. Wow, how are the bright yellow pieces glowing like that? Are they UV-reactive and you installed UV LEDs on board? In the meantime, I replaced the drive servos with 25D geared motors with encoders. That should help with switching the software to a more ROS-based setup. Welcome to the public discussions Marco! I think your motor replacement project holds a lot of promise, looking forward to hearing how ROS integration works out. It might just have to wait until after MakerFaire Bay-Area. I&apos;m kind of busy into then. Hi Roger. I just finished the initial build of my version of Sawppy. I am still working on the electronics and have designed a PC board to mount everything. I started a project page at https://hackaday.io/project/165094 and will document some things that I am doing differently. My plan is to add detail to the body to make the rover look as accurate as possible to the Curiosity rover. I took the rover &apos;off roading&apos; today. There is a video of the trip at the link above. Many thanks for your work on this project. Without your work and sharing, I would not have been able to complete a project like this. Congratulations on getting your Sawppy up and running! It&apos;s always a lot of fun for me to see one running around, climbing over things. I look forward to seeing your enhancements to make your rover look more like the real rover Curiosity. +1 I just built this as well. Great job on this project Roger. 1. What is the purpose of the differential brace? I can&apos;t seem to figure out what it is supposed to do. It is a big part so I decided not to print it. It seems like everything works without it. 2. If you are scared of using hand power tools to cut steel at home (like I am) you can use a hacksaw to cut the steel bars. It takes about five minutes to cut through a bar. On a related note, you can also use a hacksaw to cut the grooves for the retaining clips. Just put the shaft in a vice, do a couple swipes perpendicular to the vice with the hacksaw, then rotate the shaft a couple millimeters and repeat. 3. You used a cheap 3D printer (about $200). I also took this approach and bought a used Ultimaker Original for about $300. It looks like you ended up spending another $100 to upgrade the hot end. I spent hours and hours fiddling around with the printing settings, making adjustments in the model, filing / sanding / hammering parts to get them to fit together well. Amidst all of this I purchased an MK3S kit for about $700. Everything printed perfectly with no changes in the settings and printed several times faster. You may want to point out that you may save a couple hundred dollars by getting a cheap 3D printer, but you are going to pay for it by fiddling around with your cheap printer for many hours. I also noticed that the better precision that you can get with the better 3D printers results in more structural integrity of the PLA. My parts were much stronger when I printed them with the exact same infill and the exact same model with the better printer. PLA is actually pretty strong and it should not fail at the loads it will be carrying in this thing. The only advantage of PETG would be that it is more resistant to heat. I&apos;m always happy to see more Sawppy rovers taking shape and running around. Thanks for sharing the video! To answer your question: the differential brace helps distribute load along the length of the differential rod. If your Sawppy equipment bay is lightly loaded and/or well balanced, it would indeed work just fine without a brace. (Or if you use a very strong material for your differential rod.) But as you add to your rover, you&apos;ll start seeing the differential bar bending under load. And thank you for sharing your tips about the hacksaw, plus additional confirmation that cheap 3D printers always end up demanding we spend more time to address their problems. There&apos;s no free lunch here, it&apos;s always a tradeoff. Add another SAWPPY to the list of functioning builds. Just finished assembling mine and other than a few typo&apos;s I made in the configs, it works fine. Great to hear! Do you have pictures to share? I&apos;d like to see if I may. Your Sawppy looks great, Phillip! I love the red & black color theme. I am really having a good time working on this project. Your work on it is very inspiring. I think I have the electronics figured out but have a problem with programming. I&apos;ve loaded the program on a Raspberry Pi and it runs fine, but I am having trouble figuring out how to make it work with any motor except roboclaw. The way I read it, I need to change the config_roverchassis.json file to replace "robocloas" with "lewansoul". When I do this I get a &apos;unknown motor control type&apos; error. I also tried to change it to &apos;adafruit_servo&apos; with the same results. Can someone point me in the right direction? Which branch of SGVHAK_Rover repository are you in? The &apos;master&apos; branch is focused on SGVHAK rover. Sawppy code like the LewanSoul support class lives in the &apos;development&apos; branch. As for the JSON file itself, please see config_sawppy.json for example. On my Sawppy&apos;s local clone of the repository, config_sawppy.json is copied over config_roverchassis.json. I am also a beginner to robotics and the Raspberry Pi. I would like to build a Sawppy Rover and have started some of the printing and purchasing. I don&apos;t have a problem with any of the printing or construction, but would like a little more information on how the electronics are configured. Could you include a list of the electronics boards/components that are required? I am a programmer, so feel that I can figure out the programming, but it is unclear what parts I need. Sorry I didn&apos;t see your question earlier. Judging by your follow-up question, you&apos;ve figured it out but I&apos;ll post an answer for future readers: The minimum electronics components for a bare-bones Sawppy has [10 * LewanSoul LX-16A] wired in parallel with each other and to [1 * LewanSoul "BusLinker" a.k.a. "Debug Board"] to translate generic USB serial to servo half-duplex serial. That translator board is connected to [1 * Raspberry Pi] via USB. Thanks Roger this is exactly what I needed, perfect timing! I’m building Sawppy with my kids, and this was the only bit that I wasn’t quite sure of. We still have lots of printing and building ahead of us before we even get there. Thanks for an awesome project! The $ difference between JPL OSR and Sawppy is enabling our 3 kids (elementary, middle, and high schooler) to build and program this at home and really get excited about STEM, robotics and exploration. Thanks again!! I&apos;ve also just posted a schematic for everyone to reference. I&apos;m a beginner to robotics. Do you suggest I start with other smaller projects first before this one? Also, what resources would you recommend to someone who is new to this area? While I worked to make Sawppy as easy to build as I could, it is still a robot with a multi link suspension system and moving it requires coordinating ten motors. There are more beginner-friendly robots with just two motors driving wheels with no suspension. That said, if simple robots are too boring to hold your interest, by all means dig into something challenging enough to motivate you. The "best" robot will be different for everyone. As long as you are learning as you go, because the learning is what matters. Roger, this is an exceptional project. I&apos;ve been following developments since your first post announcing Sawppy back in May. We ordered the components soon after, though didn’t start printing the parts from the public OnShape design until about a month or so ago. The printing and assembly processes were very straight-forward with only a few mild surprises. The aspect of this project that caught our attention is how we’ve been able to bring into our lab off the shelf raw materials like uncut lengths of extruded aluminum beams, nuts and bolts from McMaster-Carr, FDM filament, and very straight-forward drivetrain components and control systems to construct a functional bot of this scale. I&apos;m a life-long techie. We&apos;ve taught 3D design classes and camps in East Bay schools, and been working in our garage-based 3D design lab for about 5 years. And yet, we&apos;ve learned so many tips, tricks, geometries, and processes from this project. The community that&apos;s developed around our lab is composed primarily of teenagers who design and race drones, hack scooter and skateboards, and design useful objects that they sell on eBay to earn what they need for the 5 to 10 projects they have going on at any given time. Many of these kids are also involved with FIRST robotics competitions, FTC and FRC. So when they saw the Sawppy rover come together, they didn&apos;t see a Curiosity model as much as a set of design toolkit on which to base their next generation competitive robots. So... We&apos;ve begun evolving a copy of the OnShape Sawppy design document. So far, all the changes we&apos;ve made in our version is backward compatible with yours. Our focus at this point is to increase the configurability of the design, as you can see in the list of changes we’ve made so far that’s included below. * The geometry of the LX-16A bracket changed. - The orientation of the servo is rotated 180 degrees to fit narrow knuckles and narrow tires. The area we’re focusing on next is support for drive-train and control systems that will move the bot much (much) faster than the LX-16A servos currently allow. The first step in that direction is to design in FTC-compatible (First Technical Challenge) components, which we have an almost endless supply of parts laying around the lab. Driving a bogie suspended robot around on rough terrian at high speeds will likely require adding shock dampeners to the suspension. Our longer-term aspiration is to create a more flexible robot design tool that allows designers to create robots with different dimensions, drive-trains, suspensions, control systems, and accessories. We would like all changes made to your design to be shared and merged so that there continues to be a single design used by all, if you&apos;re open to that. Roger, thanks once again for all the work you put into this design and for documenting the design and releasing it to the community. It’s awesome. Wow, Bob, this is fantastic! I love the changes made to make Sawppy parameters more configurable. I&apos;m open to the idea of having one integrated CAD file, but I just spent 15 minutes on Onshape documentation & forums and failed to find a way to merge changes made in a copy back to the master. (A "pull request" in Git parlance.) I&apos;d love pointers to documentation to do so if you know of any. In the meantime, I&apos;ll add links to your variant&apos;s Onshape CAD file. Have you guys documented your project on hackaday.io or elsewhere? I could add links to that, too. I was just in the SF Bay area last week, I should have stopped by Inventor Studios. Oh well, maybe another time. OnShape is a useful tool, though it&apos;s still just a shadow of its big brother Solidworks. OnShape has the capability to merge forked versions within a single document, though not across two documents, even if one document started out as a copy of the other. The good news is that I made a copy of your original document on 10/2/18. It appears that you haven&apos;t modified your version since 9/17/18. So if you&apos;re comfortable with the changes we&apos;ve made, we could just use our version as the master version going forward. From this point on, you could make a copy of my document that you would own, then control edit permissions for designers who you approve (like us). Then you and I and any other approved designers will make changes to this single document. The checkin process each team would go through would involve merging its changes with any other changes that have been checked in. Here are some shots of some wheels and knuckles we&apos;ve printed that are narrower (65mm). One wheel has a TPU tire on a PLA rim. The other rim was printed using transparent PETG. The third photo shows the narrow fixed knuckle from the inside. Also note that the orientation of the servo has been rotated 180 degrees. Is there any firmware for the rover? Even an incomplete codebase would be valuable and allow builders to evolve the code forward. I&apos;m working towards making Sawppy work with the open source Robot Operating System. As an interim solution, my rover is running the code I wrote for SGVHAK Rover but configured to send commands to Sawppy&apos;s LewanSoul serial bus servos. I&apos;m still printing. And given everything else on our plates, may be for awhile. We&apos;ll first print your reference design and get it running with the LewanSoul servos. But we&apos;re really here to explore how a modified rover architecture would handle itself in the FIRST Robotics ring. Yes, that would involve looking at rigidity, drive train, firmware, scalability, configurability, durability, stability, and 5 other flavors of &apos;ability. But have you seen Erector Set pieces and decade-old electronics most commonly used on FTC bots? Thanks for putting your design out for all to explore. You&apos;ve done a terrific job. It&apos;s exciting to have the OnShape geometry available to configure. As somebody coming at this as a 3D&apos;er, we really like it when we have full control of the geometry to configure based on our needs. Roger, how much scale-ability do you think there is to be had by merely changing the length of the aluminum extrusion and changing the wheel diameter? I want to create one approximately the same size as Curiosity to use as a testbed. (1) 15mm extrusion beams start twisting along their axis. Possible solution: use larger extrusion beam profiles like 60mm or alternate structural members. (2) 3D printed connectors deform under load. Possible solution: print with very rigid materials like carbon fiber infused nylon. (3) 8mm steel drive and steering shafts start bending. Possible solution: larger diameter shafts and corresponding larger bearings. Personally my 1/4 scale rover already takes up too much space at home and barely fits in my car&apos;s seat for transport. I admire your goal of going full size, that&apos;s huge! (I mean that both as a compliment and literally.) Whether you end up using my Sawppy design or not, please document your project online. I&apos;d love to watch as it progresses. Great answer. I&apos;ll think about the wheels and wheel motors. Your plastic parts may work if we scale them up for 60mm extrusion, they should have a much higher stiffness. Different motors, shaft diameters etc would be the biggest obstacle. I&apos;ll post the project when I get started. I really appreciate your feedback and love your design! Thanks again. Hello. Thank you for nice 3D modeling of Mars Rover. I started to print out each parts. I&apos;m considering electric configuration. First of all is power. How much power will be need per 1 servo?. I will use 5200mAh 2S 30C battery.. the other thing is motor/control balance. 10 servo+ 1 controller or 5 servo + 1 controller at each left/right side .. which one is better? Your battery will be more than adaquate. The LewanSoul LX-16A servo I used drew a little over 1A when stalled at maximum effort. In the worst case (and hopefully very unlikely) scenario with all ten servos stalled, that&apos;s over 10A. Let&apos;s say 15A to be conservative. A 5200mAh 30C battery can withstand peak draw of 5.2A * 30 = 156A, so your battery can provide peak power over ten times what&apos;s needed. All the motor control power management circuit is built in to the LewanSoul LX-16A servo so each motor has their own controller. The LewanSoul "debug board" controller is primarily a serial communications translator so a single one will be fine for the entire servo network. That&apos;s a nice and inexpensive venue to explore. I&apos;ll start brainstorming what kind of rover wheel I could build with these rings. Thanks for the pointer! Thanks for letting me know you&apos;re building one. It&apos;s very encouraging to hear! As you&apos;ve noticed it&apos;s still a work in progress with incomplete information, but I&apos;m happy to expedite filling in information holes on request. Since you would like aluminum extrusion dimensions, I&apos;ve filled in the "Components" section with extrusion beams and their lengths. Let me know if you need anything else. I start to learn little by little onshape. I did change your servo coupler. I&apos;m using 12mm M3 flat head hex screw and I change the length of the servo coupler to 8mm instead of 10mm. This way I could use the 12mm screw to attach the coupler with the provided adapter to the LX16A motor. https://imgur.com/a/rRuu83O. I also grind a part of the wheel to be able to tight the lock screw of the wheel using allen key. Great work! Have you considered creating a Hackaday.io page for your Sawppy build? I&apos;d love to see you detail your modifications. Why you made them, and how well they worked. Together we will keep improving the design in the spirit of open source! Excellent rover and very nice work. I&apos;m very interested to hear how you are using the servo motors rather than gear motors with encoders. Can you tell us about the software a bit? Do you use ROS - if so, what computing hardware? I do have ambition to put ROS on Sawppy and give it some autonomy, but for now I&apos;m still working on the chassis hardware. At the moment Sawppy&apos;s brain is a bare-bones piece of software that allows simple tele-operation and runs on a Raspberry Pi. (Translation: right now it&apos;s just a very expensive remote control car.) Code is up on Github, search for "SGVHAK Rover"
Awesome. I am both intrigued and jealous. I applaud your good efforts and eagerly await your next developments. You are about to report the project "Sawppy the Rover", please tell us the reason.